March 3, 1875 is believed to be the date of the first-ever indoor hockey game, played in Montreal. Some elements of that original game, including the use of a puck and the length of the ice rink, are still part of the sport today, nearly 150 years later. The game continued to grow in popularity, until in 1892, the Governor General of Canada, Lord Stanley, donated a Silver bowl to serve as a championship trophy in a competition between Canada’s amateur hockey teams. Now, 125 years later, the Stanley Cup has become the emblem of ice hockey club supremacy, and is the championship trophy of the NHL. Accordingly, no international coin collection or sports-enthusiast’s collection would be complete without the 2017 $50 Silver Stanley Cup 125th Anniversary Reverse Proof coin. 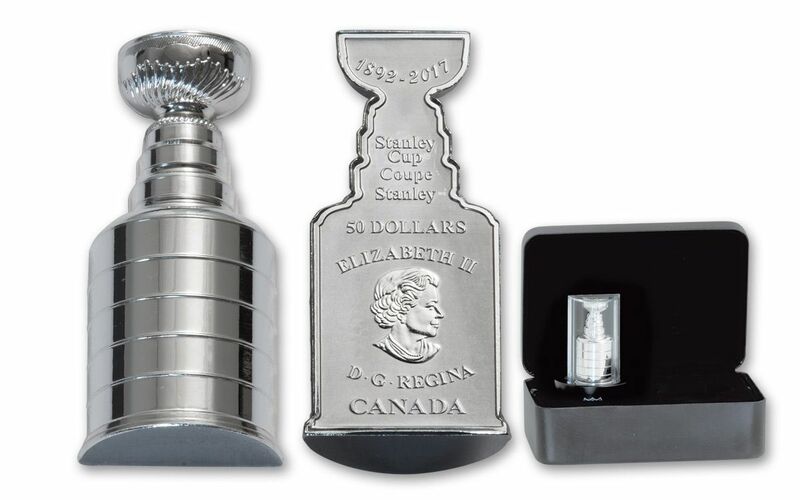 This stunning replica of the Stanley Cup commemorates Canada’s most noteworthy sport with a one-of-a-kind coin that pays tribute to hockey’s fabled prize in fantastic three-dimensional fashion. You have to see it for yourself to believe it—and you can, if you contact GovMint.com, today. The 2017 $50 three-ounce Silver Stanley Cup 125th Anniversary coin in reverse proof condition replicates the famous cup’s rounded barrel base in startling detail. It’s struck in 99.99% fine silver, and is a full 55 mm in diameter. A ONE-OF-A-KIND COIN FOR HOCKEY FANS THE WORLD OVER-- The symbol of Canadian pride since Lord Stanley donated the first cup, the Stanley Cup trophy could not receive a more honorable depiction that that of the 2017 Silver Stanley Cup 125th Anniversary Proof coin. Designed to be a reduced-scale replica of the Stanley Cup trophy, in pristine reverse proof finish, the coin is lavish in its detail. 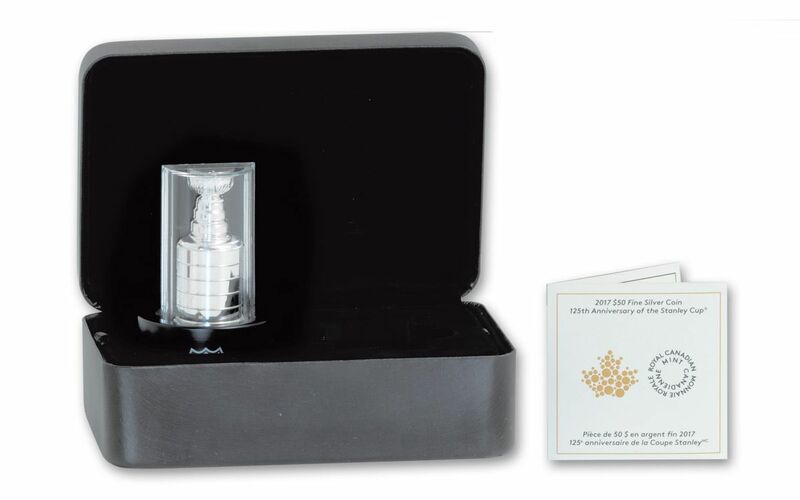 The reverse is struck with detailed engraving that meticulously recreates the ringed appearance of the Cup’s rounded barrel base, which is topped by the silver bowl that replicates the one originally donated by the Governor General of Canada, Lord Stanley in 1892. A variety of finishes applied to the surface of the reverse create a life-like sense of depth and dimension to the cup. The obverse of the coin features Queen Elizabeth II in profile, based on an original design by Susanna Blunt. 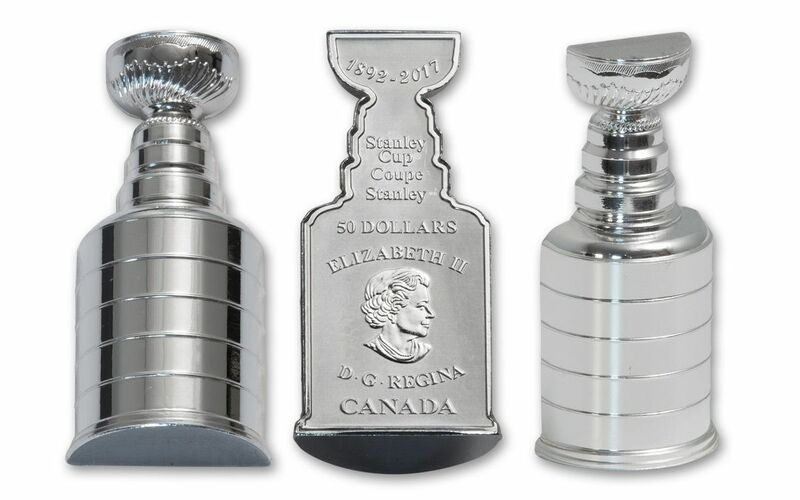 Also inscribed on the obverse are the dates "1892-2017," and the words "STANLEY CUP® COUPE STANLEY," "50 DOLLARS," along with the inscriptions "ELIZABETH II," "DG REGINA," and "CANADA." LOW MINTAGE, ELEGANTLY PRESENTED-- Adding to the coin’s value is its low mintage of only 5,000 pieces, creating instant demand for this piece. Each coin is accompanied by a Certificate of Authenticity and is housed in a custom black box. CERTIFIED REVERSE PROOF CONDITION-- Your 2017 $50 Silver Stanley Cup coin is certified in Reverse Proof condition. A reverse proof coin literally reverses what is seen on the surface of a typical proof coin--so, instead of mirrored fields with frosted raised devices, these coins feature mirrored raised devices and frosted fields. Proof coins are struck with specially made dies to ensure the unique brilliance of the piece. GENUINE LEGAL TENDER – Backed by the Sovereign crown of Canada, your coin is certified as $50 Canadian legal tender. An eye-catching design that will be the talk of your collection, the 2017 Silver Stanley Cup 125th Anniversary Reverse Proof coin enjoys a remarkably low mintage—so act fast to get yours from GovMint.com.